Book DescriptionThe chess world has been blessed by a number of wonderful strategists, innovators of the game with their instructive play and profound teachings. 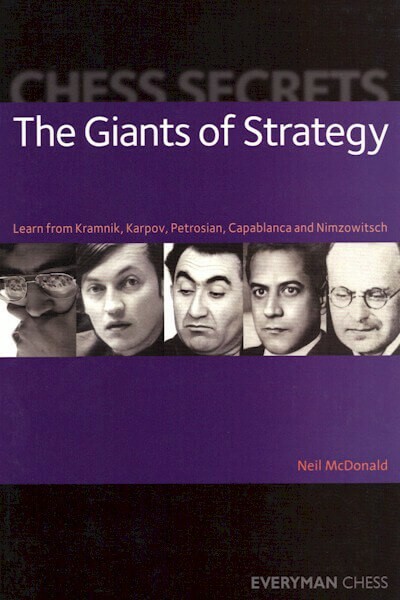 In Chess Secrets: The Giants of Strategy, Neil McDonald chooses his selection of the most prominent strategists in chess history and highlights the major contributions they made. He examines their differing approaches and styles, and from Nimzowitsch to Kramnik, how they followed in each other's footsteps. A careful study of this book will help you to understand and improve in one of the most crucial elements of the game. Chess Secrets is a brand new series of books which uncover the mysteries of the most important aspects of chess study: strategy, attacking play, opening play and gambits, classical play, endgames and preparation. In each book the author chooses and deeply studies a number of great players from chess history who have excelled in a particular field of the game and who have genuinely influenced their descendants.